Quinoa Salad | Om nom nom! A quick lunch that was a nice break form all the sandwiches and fast food that come with crazy schedules and moving. It was nice to have our kitchen unpacked enough to make lunch. I saw something similar to this on Skinnytaste, though I left out the onion and halved the olive oil. We really enjoyed it – nice to have leftovers for lunches, too! 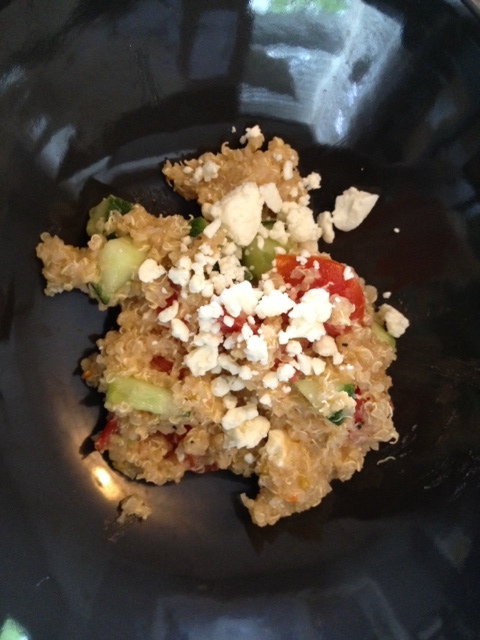 Rinse quinoa and add quinoa, water and salt to a saucepan. Bring to a boil, then reduce to a simmer for about 15 minutes. Fluff with a fork and let stand for five-10 inures to cool. Meanwhile, chop the vegetables, then add to quinoa and squeeze lemon juice over the mixture. Add olive oil, cheese, and salt and pepper to taste, toss and serve.